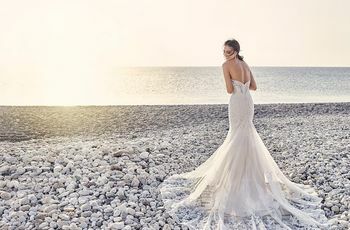 19 Bridal Veil Styles You Need to Know | Wedding Tips ARE YOU A SUPPLIER? With the endless options for bridal veils available these days, it’s easy to get lost. So let’s help you pick the perfect veil for your special day. If you're looking for a traditional look and want to be literallly unveiled at your wedding, the blusher veil is the way to go. We're seeing this style less and less, but it's a classic that won't be vanishing any time soon. If you love the classic birdcage veil, but want something a little more couture and current, a bubble blusher is just the ticket. It'll give you incredible height, volume and will certainly make a statement. We can't talk about veils without mentioning a birdcage, even though some might argue it's more of an accessory, we say it's somewhere in the middle. You can find longer birdcages that cover the entire face, or shorter ones that only cover a corner of your face. 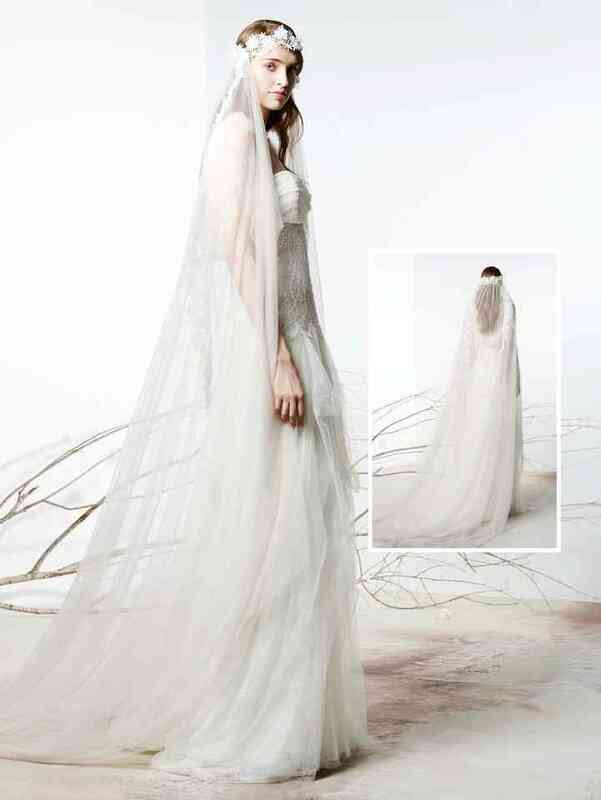 Looking for a long veil but don't want it to drag along the ground? The ballet veil is perfect for it's ideal length, falling down to the knees or ankles with the front part falling below the fingertips. This style is as elegant as its name. Let your dress shine by choosing an elbow-length veil. This style reaches the elbows or waist of the bride. If you've chosen a short or medium length dress this is a good option as well. Very long dresses tend to work best with longer veils, but it's all a matter of trying it on. Again, as the name states, this is a shoulder length veil. That said, it needn't be exactly shoulder length. This style is very retro and is also perfect for a civil wedding worn with a shorter wedding dress. Yes, you won't be surprised to learn that this style of veil falls to the level of your fingertips, but you'll find many of these styles are shorter in the front and longer in the back. This is a huge trend in veils and you can find this cut in just about any style. Another classic, the cascade veil is short at the front and slightly wavy at the sides covering the bride as if it were one layer from the head to just below the waist. You can go for something more traditional with lace or satin on the trim or a more minimalist look with pure tulle. While you don't need to get married in a chapel, this name makes a lot of sense. It's intended to be the perfect size for getting married in a small chapel, because it doesn't drag on the ground and it's the same length as the dress. That said, you should wear a floor-length dress, not longer nor shorter, if you're following tradition. And if you've got the space of a cathedral then go for the longest veil possible. You'll feel like Princess Diane herself walking down the aisle with several yards of your beautiful veil flowing behind you on the floor. To pull it off you'll need a floor length wedding dress or choose a dress with a long train for the ultimate princess bridal look. 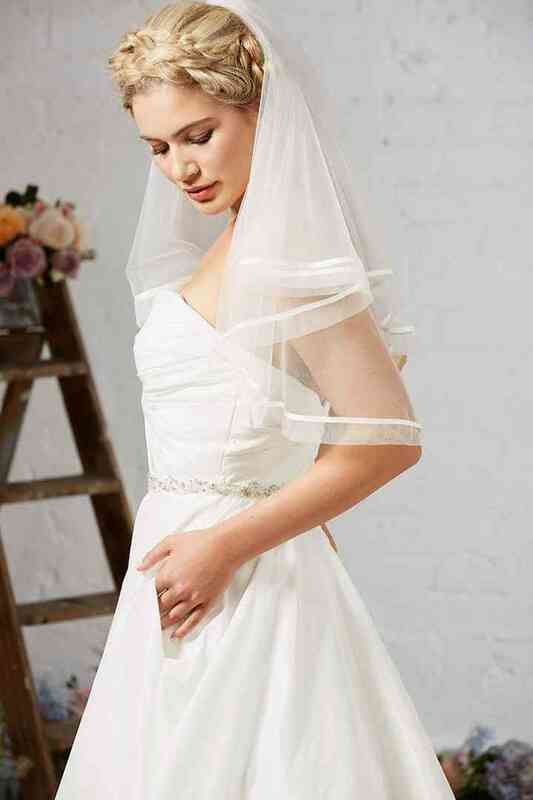 The fly away veil is a beautiful short to medium length veil with a vintage air, think Audrey Hepburn in Funny Face. This style is seemingly weightless and gives you a bit of height. The shorter fly away veil is perfect for a short or ankle length wedding dress, while you can wear a longer fly away veil with a long wedding dress. This style came to life in the 20's and 30's and creates a unique retro bridal look. It comes in many styles so you can make it yours. You can choose a simple tulle juliet cap or opt for a more intricate lace one. It can be as short as a headpiece or as long as a veil. Originating in Spain, mantilla is traditionally a silk veil that is draped over the wearer's head. It looks very effortless, and it adds a boho chic flair to any bridal look. The mantilla should be long, but not longer than the dress. It should be pinned into your hair and it's important to choose a hairstyle that won't interfere with the mantilla. We love the new takes on traditional veils. They feature a band that is like a halo around the top of your head, wrapping around your forehead and the veil falls freely in the back. It's not meant to be worn over your face, so it's more of an accessory than a veil with a purpose of unveiling you at the ceremony. 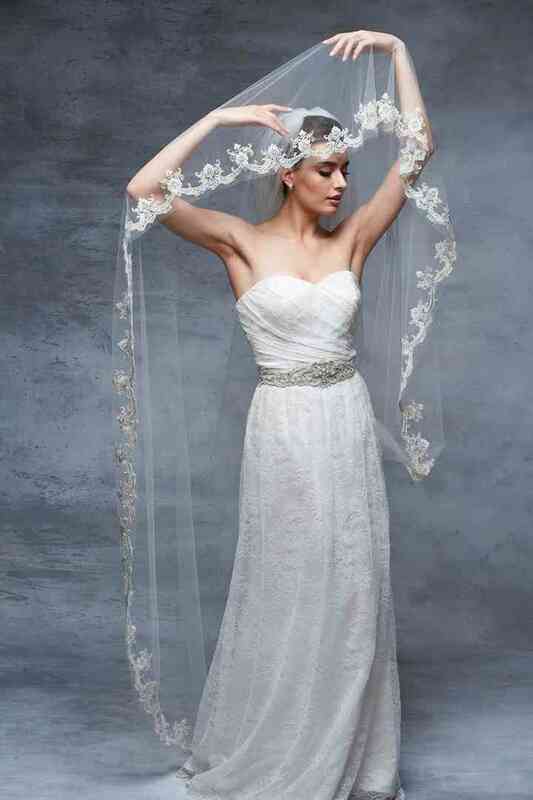 This is another boho chic style, but the veil creates a bandeau, leaving the top of the head uncovered. It's very seamless and totally 20's with a hippy chic feel. Want to look angelic on your big day? The halo veil is the perfect choice for a classic bride that wants an unveiling, but would also like something more trendy and current. The halo veil features a simple, long piece of tulle, which might also be embellished or left bare, and is draped over your head. You can wear a beautiful hair accessory underneath. Here is another rather self-explanatory name to describe a veil which has two lengths, a longer tier than might reach the floor and a shorter one that falls around your elbows or waist. It's often seen in full tulle and both classic and trendy. It's a lovely alternative to the cascade veil. There are some styles of veils that don't have a name per se - they are a combination of a veil and hair accessory. For example, a very simple tulle veil worn with a crown of flowers or a delicate bridal headband. And if you want just a hint of veil without going for a complete veil, there are many lovely bridal accessories that give you that essence of a veil without really being a veil. You can also find some that are somewhere between a blusher and an accessory if you're looking for volume. The veil is one of the most prominent elements of the bridal look. It should complement and match your wedding dress, from the tone of white to the style, shape and cut. Even though many brides these days opt for bridal accessories in lieu of a veil, the veil is such an iconic headpiece, it will give you that classic bridal look you always dreamed of. Find the perfect bridal veil for your big day. Blusher veil: If you're looking for a traditional look and want to be literallly unveiled at your wedding, the blusher veil is the way to go. We're seeing this style less and less, but it's a classic that won't be vanishing any time soon. Bubble blusher veil: If you love the classic birdcage veil, but want something a little more couture and current, a bubble blusher is just the ticket. It'll give you incredible height, volume and will certainly make a statement. Birdcage: We can't talk about veils without mentioning a birdcage, even though some might argue it's more of an accessory, we say it's somewhere in the middle. You can find longer birdcages that cover the entire face, or shorter ones that only cover a corner of your face. 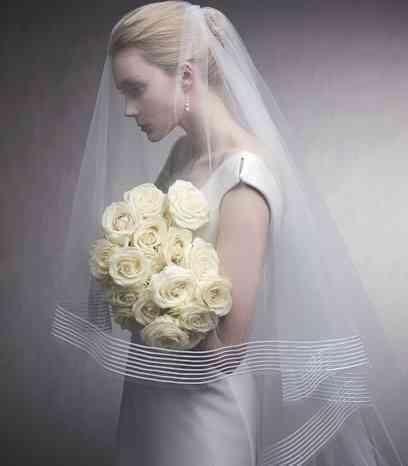 Ballet veil: Looking for a long veil but don't want it to drag along the ground? The ballet veil, also known as the waltz veil, is perfect for it's ideal length, falling down to the knees or ankles with the front part falling below the fingertips. This style is as elegant as its name. Elbow veil: Let your dress shine by choosing an elbow-length veil. This style reaches the elbows or waist of the bride. If you've chosen a short or medium length dress this is a good option as well. Very long dresses tend to work best with longer veils, but it's all a matter of trying it on. Shoulder veil: Again, as the name states, this is a shoulder length veil. That said, it needn't be exactly shoulder length. This style is very retro and is also perfect for a civil wedding worn with a shorter wedding dress. Fingertip veil: Yes, you won't be surprised to learn that this style of veil falls to the level of your fingertips, but you'll find many of these styles are shorter in the front and longer in the back. This is a huge trend in veils and you can find this cut in just about any style. Cascade veil: Another classic, the cascade veil is short at the front and slightly wavy at the sides covering the bride as if it were one layer from the head to just below the waist. You can go for something more traditional with lace or satin on the trim or a more minimalist look with pure tulle. Chapel veil: While you don't need to get married in a chapel, this name makes a lot of sense. It's intended to be the perfect size for getting married in a small chapel, because it doesn't drag on the ground and it's the same length as the dress. That said, you should wear a floor-length dress, not longer nor shorter, if you're following tradition. Cathedral veil: And if you've got the space of a cathedral then go for the longest veil possible. You'll feel like Princess Diana herself walking down the aisle with several yards of your beautiful veil flowing behind you on the floor. To pull it off you'll need a floor length wedding dress or choose a dress with a long train for the ultimate princess bridal look. Fly away veil: The fly away veil is a beautiful short to medium length veil with a vintage air, think Audrey Hepburn in Funny Face. This style is seemingly weightless and gives you a bit of height. The shorter fly away veil is perfect for a short or ankle length wedding dress, while you can wear a longer fly away veil with a long wedding dress. Juliet cap: This style came to life in the 20's and 30's and creates a unique retro bridal look. It comes in many styles so you can make it yours. You can choose a simple tulle juliet cap or opt for a more intricate lace one. It can be as short as a headpiece or as long as a veil. Mantilla: Originating in Spain, mantilla is traditionally a silk veil that is draped over the wearer's head. It looks very effortless, and it adds a boho chic flair to any bridal look. The mantilla should be long, but not longer than the dress. It should be pinned into your hair and it's important to choose a hairstyle that won't interfere with the mantilla. 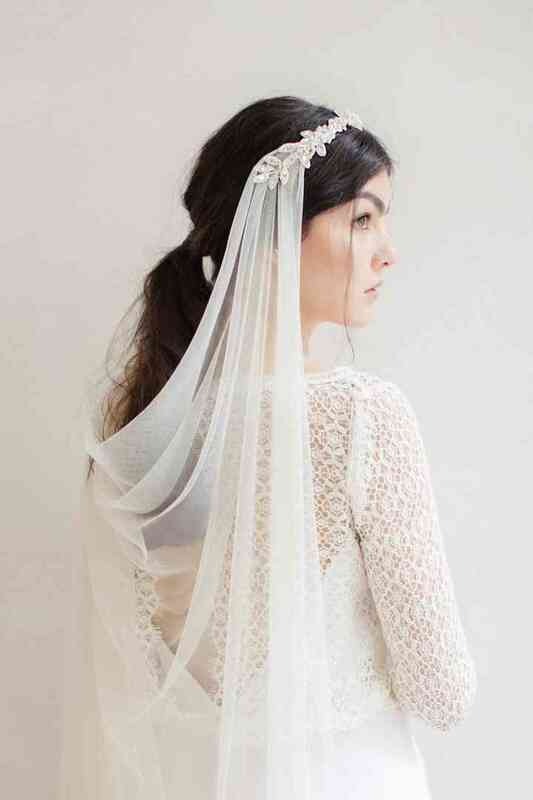 Boho veil: We love the new takes on traditional veils. They feature a band that is like a halo around the top of your head, wrapping around your forehead and the veil falls freely in the back. It's not meant to be worn over your face, so it's more of an accessory than a veil with a purpose of unveiling you at the ceremony. 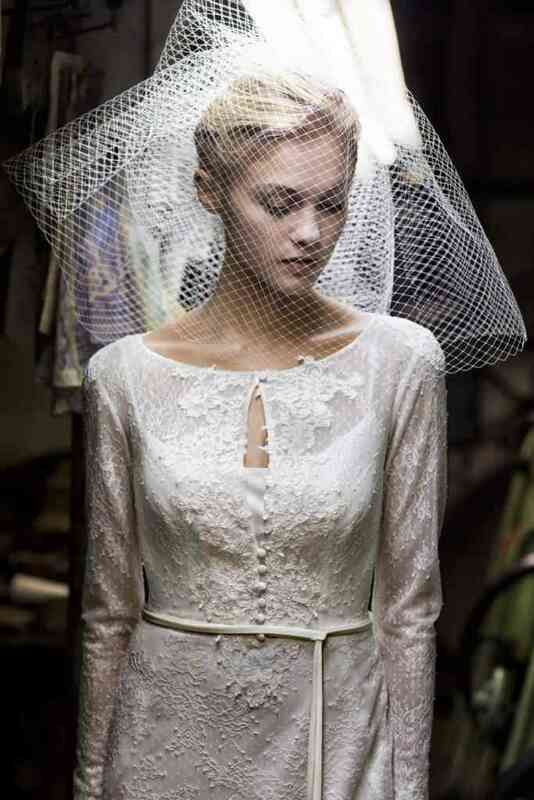 Bandeau veil: This is another boho chic style, but the veil creates a bandeau, leaving the top of the head uncovered. It's very seamless and totally 20's with a hippy chic feel. Halo veil: Want to look angelic on your big day? The halo veil, or drop veil, is the perfect choice for a classic bride that wants an unveiling, but would also like something more trendy and current. The halo veil features a simple, long piece of tulle, which might also be embellished or left bare, and is draped over your head. You can wear a beautiful hair accessory underneath. Double tier veil: Here is another rather self-explanatory name to describe a veil which has two lengths, a longer tier than might reach the floor and a shorter one that falls around your elbows or waist. It's often seen in full tulle and both classic and trendy. It's a lovely alternative to the cascade veil. Veil with accessory: There are some styles of veils that don't have a name per se - they are a combination of a veil and hair accessory. For example, a very simple tulle veil worn with a crown of flowers or a delicate bridal headband. Mini veil: And if you want just a hint of veil without going for a complete veil, there are many lovely bridal accessories that give you that essence of a veil without really being a veil. You can also find some that are somewhere between a blusher and an accessory if you're looking for volume. Discover all the beautiful bridal veils in our complete bridal catalogue!